The Learning Spaces Project at City University London is a central project led by the LDC with representatives working on the project from each of the Schools. By designing and implementing more modern innovative teaching spaces for small group teaching and learning the project aims to address the contradiction between classrooms that were designed in a previous century and modern teaching practice. The project has kicked off with the redevelopment of four small group teaching spaces (the largest being for 30 students), in order to evaluate the impact that furniture, room layout and modern technology can have on teaching and learning. We would be really interested to hear any suggestions or views that academics or students have about the new learning spaces, or any experiences that anyone has had teaching (or learning) in these rooms ( A109, A112, A216, D222) you can leave your comments at the bottom of this post, or if you don’t want to publish them please feel free to drop me an email at kate.reader@city.ac.uk. “The learning session was a Reflective Practitioner first year elective module for UG Management students. It is normally taught in a standard classroom. The room was arranged for the previous session and the wheeled chairs and light tables were easily moved. Students tended to sit with colleagues that they did not usually sit next to when in the usual class room; which is arranged in uniform rows. A couple of slightly late students did not have to disrupt the session by moving along rows of seated students, but quickly and quietly joined a table- based group. The sightlines felt immediately better, it was easier to see and communicate with all the students (some sitting on higher stools towards the back). Whereas in the normal classroom, one is faced by either a wide angle of long rows of students, or the opposite, with rows of students stretching to the back of a narrow room. 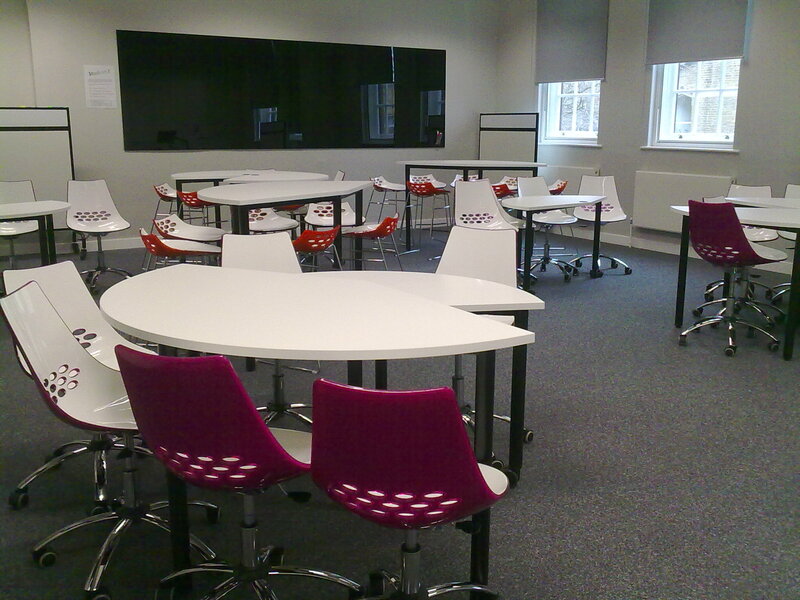 And the students one needs to try and engage more do in this type of space, tend to sit at the back. This more organic space arrangement of groups made it possible to come out from behind the pod and move easily around the room and between clusters of tables. In Q and A sessions in a standard forward facing classroom the students very often have trouble seeing and sometimes hearing the student asking the question. 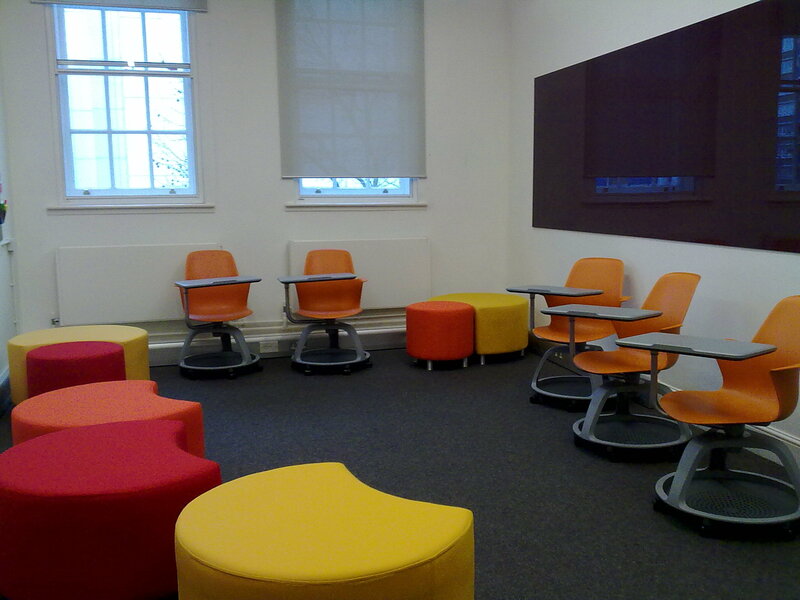 This space arrangement and swivel chairs allowed them to interact far more with each other, and the teacher, encouraging dialogue. Another major benefit is the increased amount of vertical space available for learning opportunities. Three walls feature large panels of glass, which can be written and drawn on, and have an additional magnetic property. Paper materials, index cards, images etc. can be displayed using magnets, and easily moved around, without fiddling with blue- tac. It is also possible to quickly rearrange the clusters of tables and chairs actually during the session, causing minimum disruption, and no heavy lifting. For group work and paired activities, I could more easily give support, rather than having to clamber over rows of students to get to the group on the inside, or wall end of the row. If you would be interested in teaching in the new pilot spaces, or you have been allocated one of these rooms for your teaching and would like some more information on the different ways you can utilize the space for your classes please feel free to contact Angela Dove (angela.dove.1@city.ac.uk) or Kate Reader (kate.reader@city.ac.uk). Dr Sophie Harman is Senior Lecturer and Director of Undergraduate Studies in the Department of International Politics at City University London. Towards the end of the last academic year, having heard about the School’s iTunes U project, she decided to start recording her lectures and hosting them online. Since then, the recordings have been some of the highest ranking downloads on our site. At the time, this involved recording, editing and syncing the video with the slides manually. Ahead of our lecture capture pilot, Sophie gave a short interview on her experience of recording the lectures and students’ reactions. Why did you decide to have your lectures recorded? I was approached by Mo and thought as Director of Undergraduate Studies I had a responsibility to set an example to the rest of the Department by trialing them first. How did you decide which lectures to record? I decided to begin with first year lectures because I thought they would be more flexible to new technology than some of the older years, the material in the lectures was introductory and thus more easy to understand in the recordings, and first year attendance tends to be quite good so I had less concerns about the impact of the recordings on bums on seats. Did you have any concerns? Yes – that lecture attendance would decrease; that the content of the lecture would not translate well in a recorded format – my lectures tend to be quite interactive with students which could appear quite disjointed when edited; that students would feel nervous asking me questions in the lecture or offering opinions when asked in case they thought they looked stupid. How did you address these concerns? I informed students that should attendance decline I would stop filming and remove the lectures from iTunes U; I agreed with Mo that I would review all of the lecture content to check for mistakes and flow of narrative before they were uploaded to iTunes – Mo was extremely helpful in doing this; I reassured students that they were not being filmed and any questions or comments they had would be edited out of the final recording. Was there any effect on students’ attendance? How do you think your students used the recordings? Did you get a positive response from students when you suggested it? Yes. They were quite impressed that we were doing this and that it would be free and easily accessible. Will you continue to have lectures recorded? Yes, it was nerve-wracking at first (I immediately assumed that once the camera was on I would forget how to lecture and start babbling gibberish) but Mo was very reassuring that I would have control over what content would be uploaded and after the first five minutes of the first lecture I forgot the camera was there. The students have been positive about it, and as long as it does not reduce student attendance I’m happy to continue with this. If student attendance drops then I’ll stop – I find it a useful supplement to lecture attendance, not a substitute, and I think most of the students recognize this too. City University London’s Schools of Arts and Social Sciences will be piloting a lecture capture system in the academic year 2011-12. Since we will be joining a large number of comparable HEIs who already have a lecture capture system in place, there is a large amount of research evidence from other institutions. In this post I want to give a short round up of some of the common themes which emerge from this research. Lecture capture is quite mainstream in several other countries, notably the USA and Australia. However, different course structures and admission options, such as ‘external’ and ‘internal’ students enrolling on the same courses, the ability to dip in and out of modular HE courses, and even the long-distance commutes which can be involved, mean that much of the evidence from these countries can be difficult to apply directly to our situation. So here I concentrate on findings from UK institutions offering face-to-face teaching courses. Links to all papers and articles are at the end (some are behind a paywall). Let’s look first at the benefits of these systems to students’ learning. Two kinds of study have been conducted on the effects of lecture capture on student attainment. Quantitative experiments have looked at students’ test performances, comparing the scores of those who have attended face-to-face classes to those who accessed recordings (Engstrand and Hall 2011; Owston et al 2011; Evans 2007). Perhaps unsurprisingly, most of these studies show little difference in performance. By and large such studies test factual recall only, and so do not give a very accurate reflection of how lecture capture might improve students’ learning more generally. What’s more, they examine the impact of lecture capture as a replacement for traditional face-to-face teaching, when staff and students normally report that they prefer it as a supplement (Roy and Roy 2007; Buchanan et al 2011; ALTC 2008). This echoes findings from other countries (Karakostas et al 2010; Glogoff 2009; Vogt et al 2009; MacQuarie 2009; De Santis et al 2010). Qualitative studies looking at students’ and staff members’ perceptions, however, demonstrate the benefits of using lecture capture alongside, rather than instead of, traditional teaching. One of the most compelling reasons for using lecture capture is that it offers an easy way to devote more time to difficult ideas or topics. This can be achieved in two ways. First, such systems mean that students don’t have to scribble frantically during lectures, missing the wood for the trees, but instead are free to listen more deeply, contribute more, and make more concise notes (Newland et al 2010; Engstrand and Hall 2011). Secondly, lecturers can create short recap presentations of the most commonly misunderstood topics (the so-called “muddiest points”), saving time in lectures and responding to student needs (Pinder-Grover et al 2011). Many studies show that students appreciate the facility and feel that it improves their learning. The University of Sussex has installed a system in seven lecture theatres and in a survey conducted in December 2010 found that over 80% of students agreed or strongly agreed with the statement that lecture capture supports their learning (University of Sussex 2011). Lecture capture is a huge help to students with learning difficulties, or those who have English as a second language (Robson and Greensmith 2009; Bell 2007; Engstrand and Hall 2011). There is also a very clear benefit to all students at revision time. Studies looking at usage patterns for lecture capture systems report that access peaks before exams (Stokes 2008; White 2009). Some lecturers take lecture capture even further, pre-recording the more didactic parts of their lectures and using class time for more interactive discussion and activities (Pinder-Grover et al 2011; QMUL 2010; Palmer 2011). Before iPods, and before the dawn of podcasting in 2004, college professors provided (and continue to provide) students with various other forms of online resources including audio and notes. Similar to the debate surrounding podcasts, these supplements were said to have a potentially counterproductive effect of decreasing student attendance. It may be, therefore, that the key to maintaining attendance and engagement while adopting lecture capture is to emphasise the aspects of teaching which do not make it on to the recording – thereby creating incentives to come to class, even while giving students the chance to review things they missed or need to revisit. ALTC, 2008. The Impact of Web-Based Lecture Technologies on Current and Future Practices in Learning and Teaching. Australian Learning and Teaching Council. Bell, T. et al. 2007. Podcasts as a supplement in tertiary education: An experiment with two computer science courses. Bongey, S. et al. 2006. Explorations in course-casting: Podcasts in higher education. Campus-Wide Information Systems, 23 (5). Buchanan, W. et al. 2011. Student perception of on-line lectures within a blended learning environment for Security and Digital Forensics. Paper presented at Edinburgh Napier University Staff Conference, Craiglockhart. De Santis, L. et al. 2010. Lecture capture – an emerging and innovative technology with multiple applications for business schools. Business Education Innovation Journal. Engstrand, S. And S. Hall. 2011. The use of streamed lecture recordings: Patterns of use, student experience and effect on learning outcomes. Practitioner Research in Higher Education, 5 (1). Evans, C. 2007. 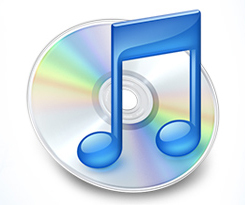 The effectiveness of m-learning in the form of podcast revision lectures in higher education. Computers and Education (50). Glogoff, K. 2009. Podcast your lectures: Or, why students will still attend class. Karakostas, A. et al. 2010. E-lectures to support blended instruction in multimedia programming course. In Proceedings of ITiCSE’2010. MacQuarie, 2009. Making the most of lectures through iLecture. McGee, P. and V. Diaz. 2007. Wikis and podcasts and blogs, oh my! What is a faculty member supposed to do? EDUCAUSE, September/October 2007. Newland, B. et al. 2010. Enhancing the student learning experience with captured lectures. In Proceedings of World Conference on Educational Multimedia, Hypermedia and Telecommunications 2010. Owston, R. et al. 2011. Lecture capture in large undergraduate classes: Student perceptions and academic performance. Internet and Higher Education. May 2011. Palmer, J. 2011. Touchcasting digital lecture notes. Journal of Computing Sciences in Colleges, 26, (4). Pinder-Grover, T. et al. 2011. The efficacy of screencasts to address the diverse academic needs of students in a large lecture course. Advances in Engineering Education. QMUL, 2010. Law lecturer turns his lecture material into podcasts. Robson, N. and J. Greensmith. 2009. Educational podcasts: Some early evidence and thoughts. International Journal of Management Education, 8 (3). Roy, A. And P. Roy. 2007. Intersection of training and podcasting in adult education. Australian Journal of Adult Learning, 47 (3). Stokes, C. et al. 2008. Does podcasting make a difference? An account of podcasting use in teacher and student-led teaching in two faculties at the University of Sheffield. University of Sussex. 2011. Echo 360 lecture capture. http://www.sussex.ac.uk/elearning/audioandvideo/lecture_capture/why. Vogt, M. et al. 2010. The impact of podcasting on the learning and satisfaction of undergraduate nursing students. Nurse Education in Practice, 10. White, B. 2009. Analysis of students’ downloading of online audio lecture recordings in a large biology lecture course. Journal of College Science Teaching, 38 (3).